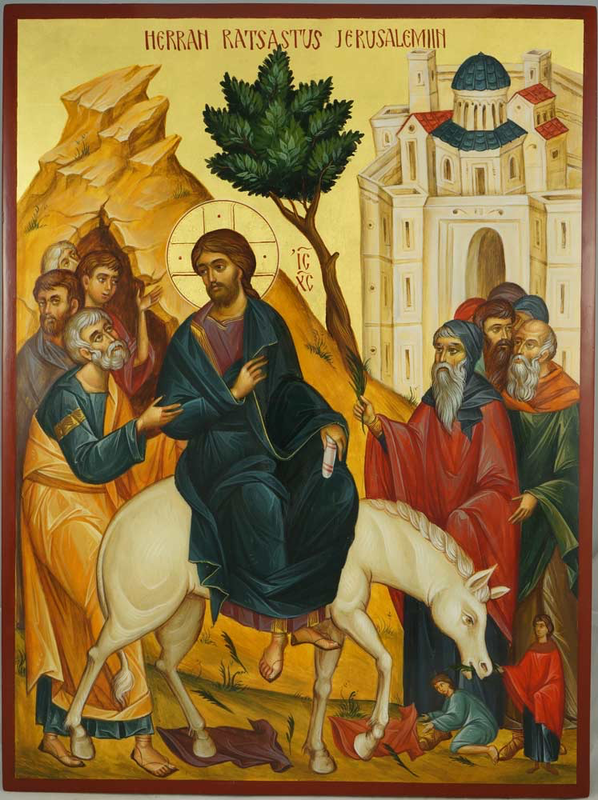 The Palm Sunday liturgy is built around paradox. We begin outside in the courtyard with the Liturgy of the Palms. We hear the story of Jesus' triumphal entry into Jerusalem and the people waving leafy branches and shouting, "Hosanna! Blessed is he who comes in the name of the Lord!" After the palms are blessed, we process into the church singing "All Glory Laud and Honor." Once inside, the tone of the service shifts abruptly as we sing "Ride on, Ride On in majesty." We move from joy to sorrow. The Passion Gospel is read in parts with the congregation taking the part of the crowd, saying "Crucify him! Crucify him!" This is a powerful experience and speaks of the vicissitudes of human nature and God's great love for us. Evensong marks the end of the day and prepares for the approaching night. In this service we are invited to reflect, to pray for the world and for ourselves, and to commend all into God’s hands as words of Holy Scripture are said and sung. The beauty of the music is offered to help us set our lives in the light of eternity; the same light which dwelt among us in Jesus, and which now illuminates us by the Spirit. Our service centers in Holy Week themes leading up to the great Three Days of Maundy Thursday, Good Friday, and Holy Saturday. Refreshment follows the service in our Holy Hour tradition. April 18 + Maundy Thursday, 7:30 p.m.
During the Maundy Thursday liturgy, we celebrate Jesus' Last Supper with his disciples before his betrayal and crucifixion. Maundy comes from the Latin mandatum and refers to the new commandment that Jesus gave his disciples to love one another. There are two special focal points for this service, the foot washing and the institution of the Eucharist. After the sermon, those who wish to participate are invited to come forward to have their feet washed and to wash one other person's feet. We do this to commemorate Jesus' symbolic action of washing his discipleâ€™s feet in anticipation of his death. He tells them "Just as I have loved you, you also should love one another." As we celebrate the Eucharist on Maundy Thursday, we become aware that we carry on the tradition that Jesus himself instituted on the night before his death. The Holy Eucharist is at the very heart of our life in Christian community. After the Eucharist, we strip the altar in preparation for the starkness of Good Friday. This reminds us that Jesus' body was stripped before he was crucified. A member of the choir will chant Psalm 22, "My God, my God, why have your forsaken me?" while this is being done. We depart in silence and deep contemplation. Note: The church will remain open for prayer for one hour after the service has concluded. April 19 + Good Friday, Noon and 7:30 p.m.
We enter a very stark church on Good Friday as we prepare to commemorate Jesus' crucifixion. The Good Friday liturgy helps us to reenter that moment in history and reflect on the brokenness of the world. The procession is silent. The Passion Gospel will be sung in parts by three cantors, taking the parts of Jesus, Pilate and others. Special prayers are offered that are specific to Good Friday. Confessing our sins takes on a particular poignancy on this darkest of days in the church year. There is no celebration of the Eucharist on Good Friday, but we receive the Sacrament of Christ's Body and Blood that was consecrated on Maundy Thursday. Receiving the bread and wine reminds us that even on Good Friday, Christ is still present to us. Jesus died once and his Resurrected Presence is with us now and forever more. April 20 + The Great Vigil of Easter, 7:30 p.m. The night before Easter is the Christian Passover. We commemorate Jesus passing from death into new life. We begin in the courtyard and light a fire against the darkness of the night. From the fire, we light the Paschal candle, the big candle that represents Christ as the Light of the world. We then light our individual candles from the Paschal candle and process into a darkened church that has been adorned for Easter. The Paschal candle is placed beside the baptismal font and we gather around to hear the cantor sing a beautiful, ancient piece called the Exsultet that expresses the mystery and majesty of this most holy night. Then, we are all seated and hear the story of salvation history, readings from the Old Testament, interspersed with especially lovely music. Then, we proclaim, "Alleluia. Christ is risen. The Lord is risen indeed. Alleluia! "All of the lights are lit and we ring bells, sing an Easter hymn, and hear the Epistle and Gospel reading. Then we celebrate the Eucharist with special joy and fervor, giving thanks for all that Christ has done and is doing for us and through us. (Note: In the early church, this was THE night for baptism.) We conclude by â€œbreaking our Lenten fastâ€ with a sparkling cider, champagne and chocolate reception. 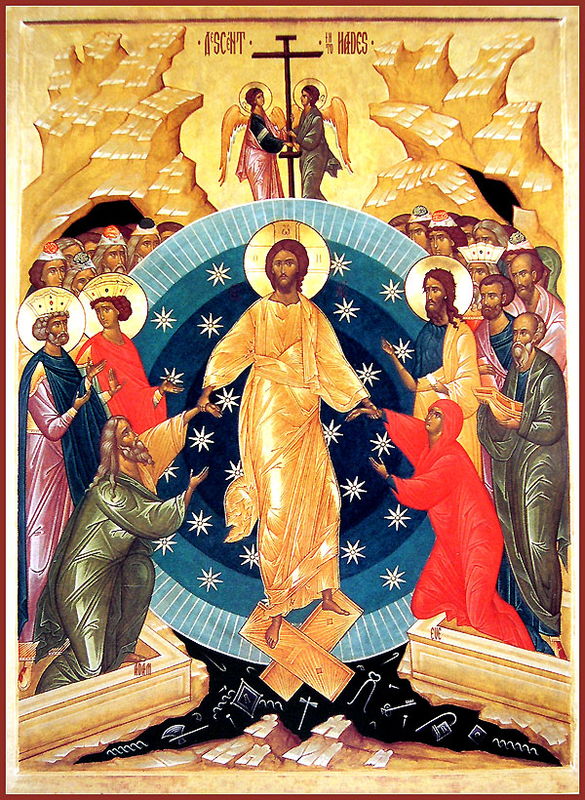 April 21 + The Day of the Resurrection: Easter Day, 9:00 and 11:15 a.m. NOTE THE SPECIAL SERVICE TIMES. Choirs and Brass at Both Services. We continue the Easter celebration that was begun at the Vigil the night before. We have a joy-filled liturgy and give thanks for Jesus' triumph over death and the new life that he shares with us. Children can process and fill a cross with flowers. There will also be an Easter egg hunt in between the services at 10:30 a.m. and a special festive coffee hour hosted by the vestry after both services. It will be wonderful to share our Nave with family, friends and neighbors! Note: Easter is a season that just begins on the Day of the Resurrection. The Easter season is called the Great Fifty Days. The Great Fifty Days culminate with the Day of Pentecost (the coming of the Holy Spirit) on Sunday, June 9, 2019.